As a library administrator, you can customize the look and structure of the documents in your library. This is done at the document class level. The document display settings define how the Properties panel is displayed in documents. 2. Select the class you want to configure under Document classes. 3. Select the Document view configuration tab. 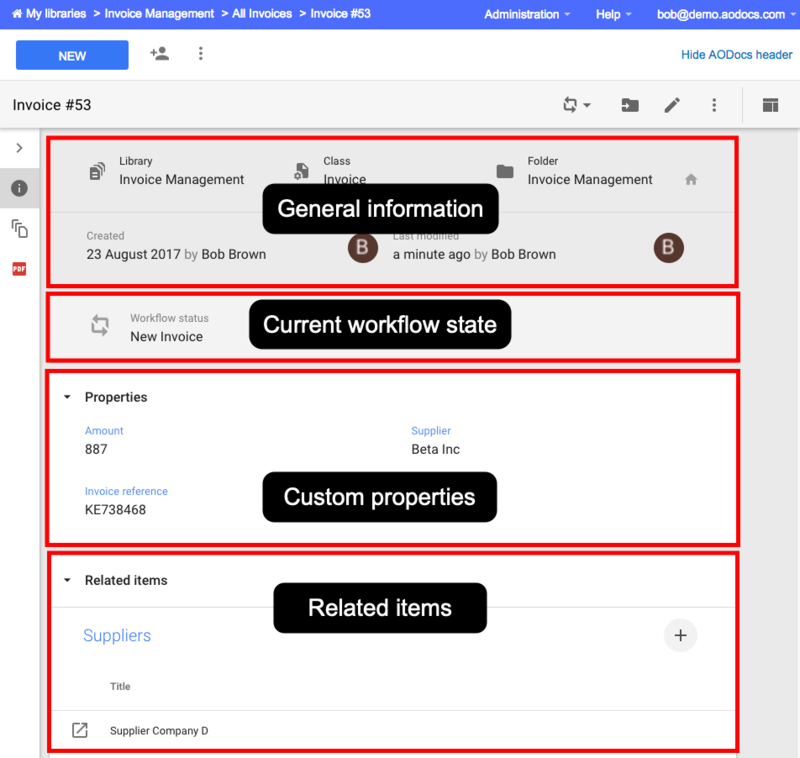 For both the current version and previous versions of documents, you can configure which sections of a document to display. Tips: For some business cases, the previous versions should display fewer sections than the current version, as they can be considered as inactive. For example, workflows or relations can become irrelevant for previous versions. Note: The Attachments section is available only for Document Management libraries. 1. To configure the display of current version, update the panels under Order of sections for the current version. The customize the display of previous versions, update the panels under Order of sections for the previous versions. 2. For both the current version and the previous versions, select which sections to display and in which order. To display a section, select it in the left panel and use the right arrow to move it to the right panel. To hide a section, select it in the right panel and use the left arrow to move it to the left panel. Note: If you remove the Attachments section, you won't be able to delete attachments in your library. To change the order of the sections displayed, select a section in the right panel and use the up and down arrows. Tip: You can also drag and drop sections. To configure which relations to display and change their order, select the Customize visible relations checkbox. To display a relation, select it in the left panel and use the right arrow to move it to the right panel. To hide a relation, select it in the right panel and use the left arrow to move it to the left panel. To change the order of the relations displayed, select a relation in the right panel and use the up and down arrows. Tip: You can also drag and drop relations. - The text between double quotes is what end-users will see in the interface. - Any relations you create (learn more: Configure relations) after customizing the list will not be displayed by default. To select your new relations for display, return to the list and move them from the left panel to the right panel. 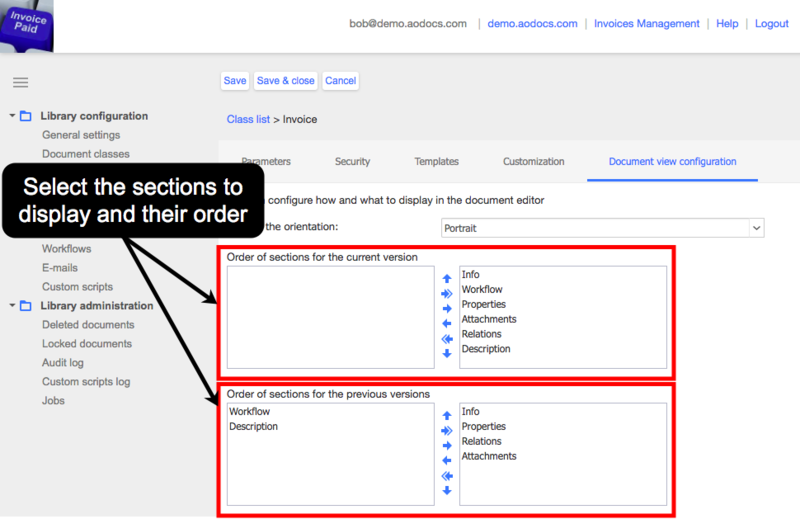 To keep all relations selected for display in the default order, deselect the Customize visible relations checkbox. The relations are grayed out and you can't move them or change their order. Any relations you create will be selected for display in the order in which they were created. [video] How to control who can create documents?